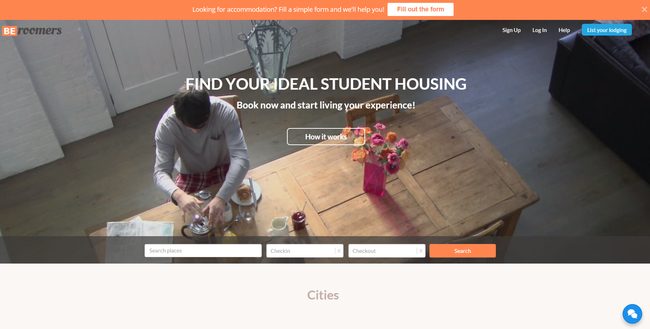 Beroomers is an Airbnb style accommodation marketplace for students and young professionals, specialised in stays from 1 to 12 months. Through Beroomers tenants can book easily and safely online, due to secure payment and the system of verification of properties. Beroomers offers thousands of accommodation options (rooms in shared flats and student halls, homestays and complete apartments) in more than 40 cities and 5 countries: UK, Spain, USA, France and Italy. You can find hundreds of different options available in London. 100% safe: the booking amount is charged after the landlord confirms the booking request, within 2 working days. The money is only transferred to the landlord after the tenant found everything according to the ad at check-­in. Useful blog with tips for living abroad and information about cities and neighbourhoods. Use the promo code BROKEINLONDON to get £20 discount on the booking’s service fee (valid until 31/12/17). Introduce your check-­in and check-­out dates to search on the web page to see the options available. Introduce a street or point of interest near where you would like to live to see results sorted by distance to the point.